After the teens of the youth group at St. Anthony of Padua Parish in Clarksville spent several hours stocking shelves at Bonnie’s Food Pantry, the charity’s director offered the hungry teenagers ice cream. The 19 youths were holding true to the experience they had embarked upon the night before—the high school-aged group’s sixth annual Food Fast. The experience consists of 24 hours of fasting and service. It is designed to help “our youth to gain a deeper understanding of the Catholic traditions of fasting” and service, said Stacy Gillenwater, the parish’s youth ministry coordinator. “They also walk away from the experience with a better appreciation for the many meals they routinely receive in their lives,” she added. The experience started on Feb. 19 with evening Mass, followed by a candlelight service in the gym at St. Anthony of Padua School. Gillenwater led the high school youths in games to help them identify and discuss different works of mercy. “We talked about statistics, like one in every five kids go without enough food [in America]. Some of the kids built a shanty town out of cardboard and slept in that” to empathize with the homeless, she said. Before the youths slept, they watched and discussed the movie God is Not Dead. Eighteen-year-old Abbi Hamm, a senior at Our Lady of Providence Jr./Sr. High School in Clarksville who helped plan the event, said some good discussion followed the showing of the film. “We reflected that we don’t have to go on a mission trip—we can do stuff here in our parish and town that is winning hearts for God. It might not seem like we converted someone today by cleaning out a van or stocking a shelf, but that’s God’s work, too. It’s where he wants us here and now. “That set the tone for the next day when we did work in the community,” Abbi noted. The next morning, Gillenwater started the day with group prayer—but of course, no breakfast. The first stop for the service portion of the experience was Bonnie’s Food Pantry in Jeffersonville. 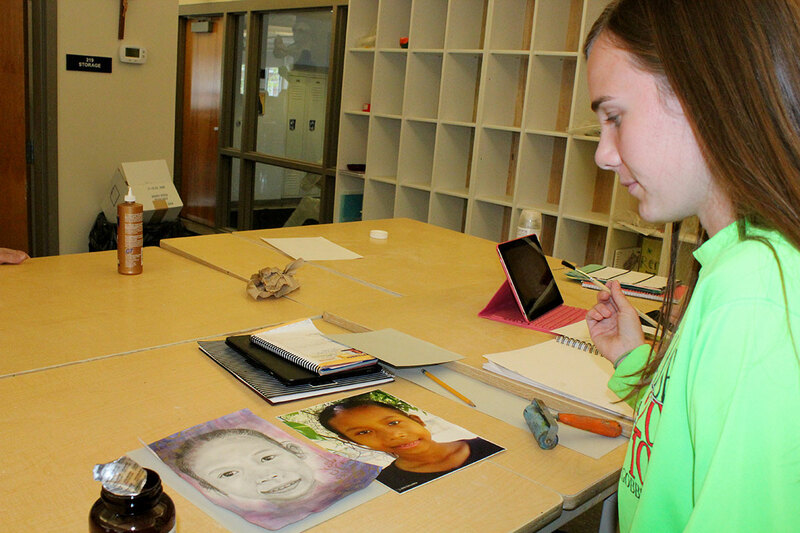 Fifteen-year-old Katie Baker, a sophomore at Our Lady of Providence Jr./Sr. High School, was impressed with the woman who operated the food pantry. After more than two hours of reorganizing and stocking shelves, the group headed to a neighborhood, going door to door asking for canned goods. 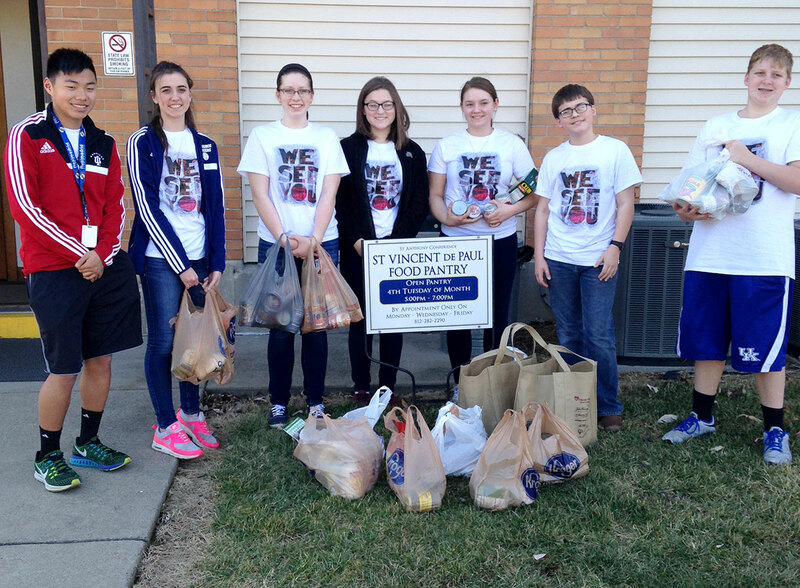 They collected more than 200 cans, and delivered them to the St. Vincent de Paul Food Pantry at their parish. The beautiful weather on Feb. 20 made the next act of service more pleasant as the youths cleaned the grounds of St. Elizabeth Catholic Charities in New Albany. Helping around the charity’s grounds was the service highlight for Alex. For the last act of service for the day, the youths returned to the parish to put together toiletry kits to be distributed to the homeless by “Jesus Cares at Exit 0” ministry. After journaling about their experience, the youths met for 5 p.m. Mass to break their fast. “I love ending our fast with what fills us the most—Jesus,” said Abbi. “I love that we don’t go out to dinner.